Since pure quartz (silicon dioxide) is colorless, the various colors of quartz are believed to derive from the presence of trace elements. Citrine is colored by traces of iron. Much of the commercial grade material in the market has been produced by heating amethyst, which will turn yellow at relatively low temperatures and deep yellow to red-brown at higher temperatures. However, natural citrine does exist and deposits are found in Brazil, Madagascar, Namibia, Burma and the USA. 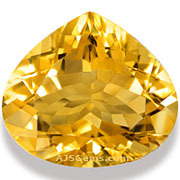 Many buyers of higher quality citrine are concerned to buy naturally-colored citrine rather than heat-treated amethyst. The purple color of natural amethyst was once thought to be due to traces of manganese, but the current thinking is that it is actually due to natural irradiation, which causes the rearrangement of iron ions in the crystal lattice. This process can be partially reversed by heat treatment, which is why purple amethyst will turn yellow under low temperature heating. However, low temperature heating is very difficult to detect even by gemological testing, so even the best gem labs are not able to certify citrine as unheated. The best way to be sure of buying naturally-colored citrine is to buy from a reputable dealer who knows his source and the provenance of his gems. But in point of fact there are more serious dangers in the citrine market. Much of the citrine in the market is actually synthetic rather than natural, produced in laboratories using the hydrothermal process. This synthetic citrine can be very difficult to detect and requires gemological testing with sophisticated instruments such as infrared spectrometers. Gemologists can sometimes identify synthetic quartz by the presence of the seed crystals used to grow it in the lab. Another indicator is the presence of untwinned crystals, though it is now possible to use the hydrothermal process to produce twinned crystals. Gem labs look for the distinctive absorption spectra of synthetic and natural quartz. For consumers, the best way to identify synthetic quartz is by size, clarity, color and price. You will often find synthetic citrine in the market in very large sizes with perfect clarity and consistent color. 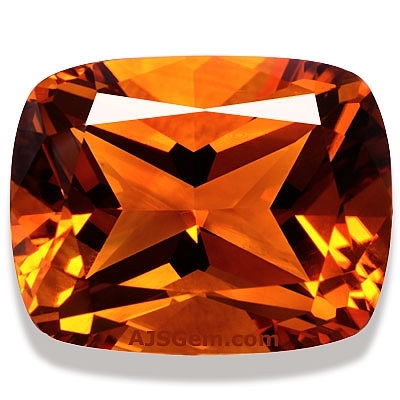 Natural citrine will usually exhibit subtle color zoning that you won't see in the synthetic material. You will also find quartz in the market in colors that don't occur in nature, such as a bright mint green or a vivid blue. This is a sure sign the material is synthetic.